The base model of the third generation Focus looks pretty decent. 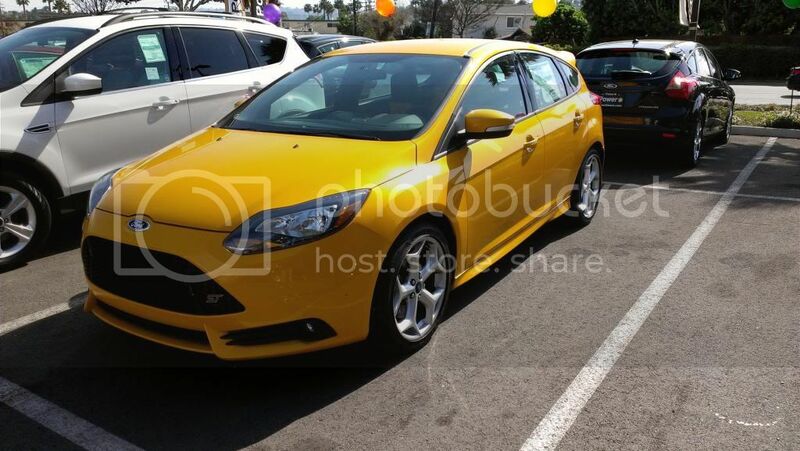 With the ST treatment, the Focus goes from pedestrian commuter to true hot hatch. The large 18 inch wheels, aero bits, and large gaping grill opening really creates an aggressive and sporty looking hatchback. Aside from the Subaru WRX, the Focus ST is probably one of the most aggressive looking hatchbacks I have seen in a while. For some reason, the rear of the car looks especially impressive, especially with the twin, center exit exhaust. 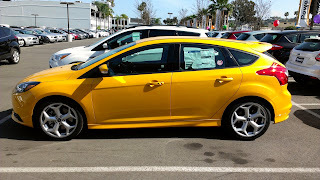 While I cannot really comment on the first generation SVT Focus, I can safely say that Ford got driving enjoyment right with the Focus ST. Everything from the excellent 2.0 liter "Ecoboost," turbo-charged inline-4, to the sporty suspension, was definitely done right with this car. For starters, the engine in the Focus ST is phenomenal. Ford's 2.0 liter "ecoboost" engine makes an astounding 252 horsepower and 270 lb./ft. of torque. Though all this power may be channeled through the front wheels, the Focus ST seems to manage torque steer quite well, all well maintaining the ability to accelerate quickly. Power delivery is extremely smooth with only just a tiny hint of turbo lag. The exhaust note is deep and throaty under hard acceleration but unobtrusive during normal cruising. This motor is truly awesome. Routing the power to the front wheels is a slick shifting six-speed manual transmission. The transmission is very precise and has great feedback through the gates. Each shift is met with a satisfying "thunk," giving the driver confidence that every shift was precise and clean. I dare say that the Focus ST's shifter is as good as some of the best shifters out of Honda's stable such as the shifter in the Civic Si or the Accord Sport. Aiding in the transmission's lightning quick shifts and precision feel is a well weighted clutch with a relatively short travel distance. The clutch also gives great feedback, which allows the driver to learn quickly where the clutch engages. Handling was genuinely surprising with the Focus ST, especially considering that this is a front wheel drive car. Turns are crisp and body roll is minimum. Though hard cornering does cause the car to exhibit a little understeer, it is not enough to get the car bent out of shape. At its limits, I am sure the front wheel drive will present a problem with understeer, but seeing as I was driving this car on the street, it was never a problem. Aiding the confident handling is an exceptional steering feel. Though a tad bit on the light side, the thick rimmed wheel offers quite a good amount of feedback, letting the driver know where the wheels are pointed and what they are doing. This is easily one of the better electric power steering racks I have experienced in a while. Cargo space happens to also be one of this car's strong points as well. I am not sure if it has the most cargo space in its class, it certainly offers plenty of room. 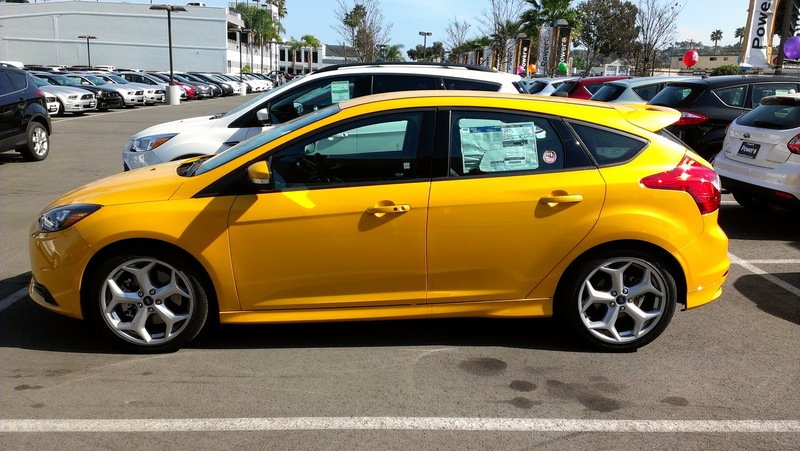 Seats up, the Focus ST offers an astounding 23.8 cu.ft. of storage. 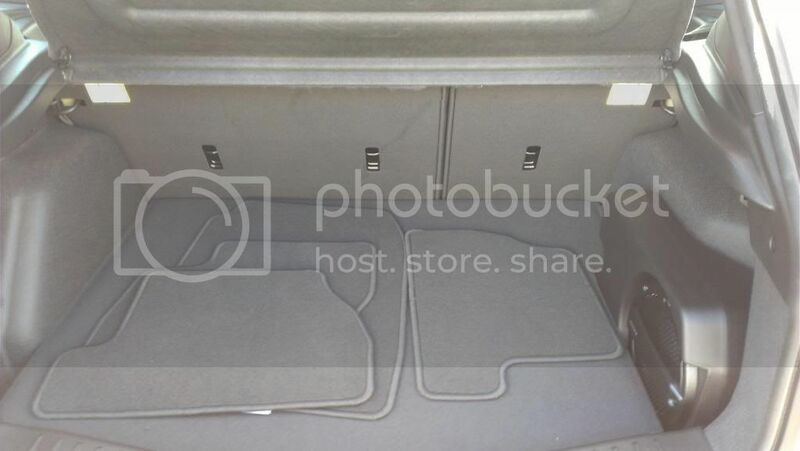 All seats folded flat sees 44.8 cu.ft. of cargo space. This would definitely be a good car for road trips, as long as those road trips are not too long. When it comes to the drive, the Focus ST is exceptional. The only minor quibble I had with the way the Focus ST drove was that its suspension was a little rough. Going over rough patches of road unsettled the car a bit more than I had expected. The aggressively bolstered Recaro seats also did not do much to absorb any shock going into my back from bumps and potholes. 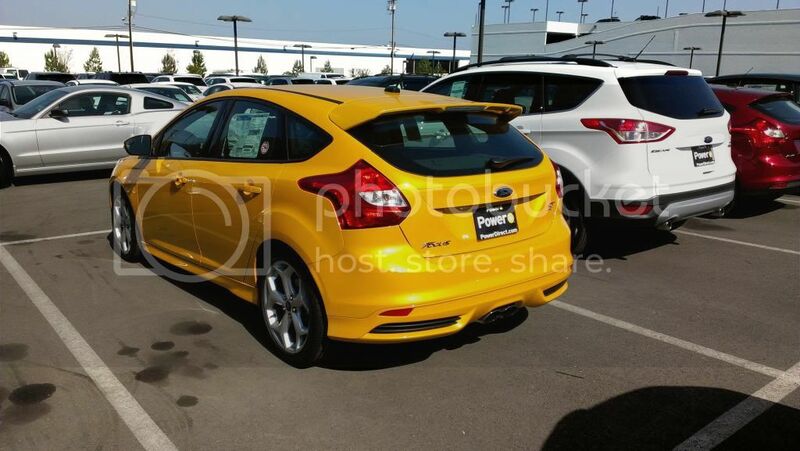 The Focus ST, however, is supposed to be the sport model of the Focus, so these kinds of things are somewhat to be expected. What cannot be unexcused though, considering the price of this car, are the quality of its interior materials, the initial build quality, and the flaky infotainment system. 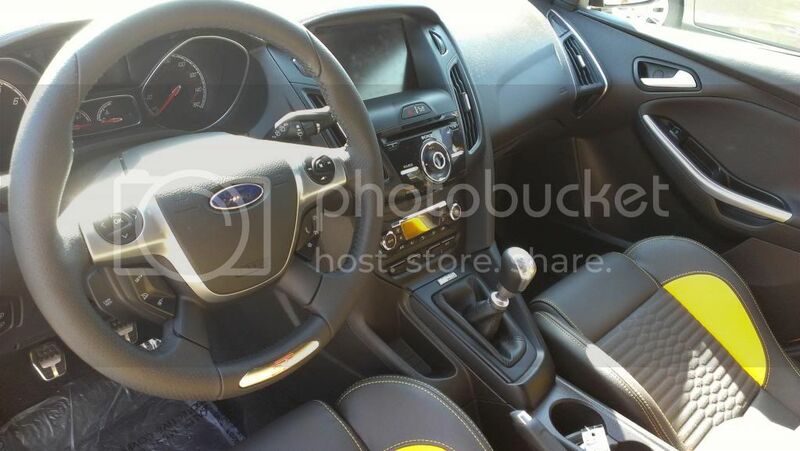 Being based off of the cheaper and pedestrian Focus, the basic Focus' cheap feeling interior carries over into the ST. The shiny bits of black plastic that adorns the buttons and surrounds the controls MyFord touch screen navigation, look and feel incredibly cheap. All of the supposedly "soft touch" plastics that cover the dash have a cheap and hollow feel to it. The saving grace of the interior are the Recaro leather trimmed seats and the leather steering wheel. While these individual items look a lot nicer than the rest of the interior, they are not without their own faults. The steering wheel seems to be mounted at a funny angle, and no amount of adjusting the steering column could get it to a comfortable position. The seats are also too aggressively bolstered and can become uncomfortable on long drives. Over the last few years, Ford has made leaps and bounds with improving its initial quality. Despite these improvements, I still find initial build quality to be a bit questionable. At the end of my test drive, the salesman pointed out that the dash mounted turbo boost gauge was not working. He surmised that this could either be a wiring issue or a faulty gauge. While a minor issue, this makes me worry there could be other small electrical issues in the car that could potentially lead to major issues. Speaking of electronics, the $28,120 as tested price includes the MyFord Touch system with voice recognition. In theory, the system sounds great and has some very cool features. Unfortunately, this system's capabilities are actually spotty at best. For example, before the salesman and I left the parking lot for our drive, he attempted to change the AC temperature to 65 degrees by using the voice command system. It took him four tries before the system recognized the command to turn the air conditioning down to 65 degrees. The three previous tries saw the system attempt to adjust the radio, make a phone call, and attempt program a navigation destination. It was really quite ridiculous. Also plaguing the system was mind boggling slow touch functions. Touch a button on the touch screen, and it takes the system a few moments to respond. It is quite infuriating, but it seems to be a general problem that plagues current automotive touch screens. I will be the first to admit that I was never a fan of Ford vehicles. For as long as I can remember, I had been running under the assumption that Ford was only capable of building cheap, mediocre, and slow vehicles. In fact, I was even one of those guys that joked that Ford was an acronym for "Fix or Repair Daily." The Focus ST has really changed my perspective on Ford's vehicles. I went into this test drive with relatively low expectations and was blown away by how the car drives. Out of all the hot hatchbacks I have test driven, the Focus ST is easily one of the best. Would I actually buy one? I am on the fence with the Focus ST. It drives incredibly well, offers ample cargo space, and is priced fairly decently. The two things turning me off to the Focus ST are its rock hard suspension, and initial quality issues. Also, the Focus ST is a brand new model for the American market, which means there are going to be some teething issues during its first year of sale. As with almost every new model, it is a safe bet to give the car a year so the manufacturer can work out any kinks or minor defects with the car. With that said, I would probably not buy one now as I would rather wait a year or two for Ford to work out any potential problems with this car. I finally got a chance to drive the ST for myself and it is a great performance car. The suspension is stiff, but not uncomfortable over smooth roads. Broken surfaces definitely cause things to get a bit busy. However, it is almost worth it to overlook that for the power delivery of the EcoBoost motor.